Table of Contents Next: Fairey Aviation Company Ltd.
U.S. Air Force. Via Wikimedia Commons. 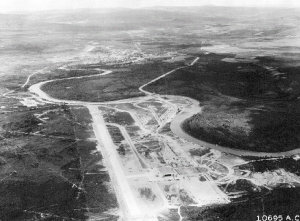 Fairbanks (147.644W 64.826N) was the center of the road network for central Alaska and the location of the Air Corp's northernmost Pacific base, at Ladd Field. Located just south of the Arctic Circle, Fairbanks was an ideal test site for cold-weather equipment, which was its principal military activity during the war. The climate was trying, with a cool summer and frigid winter in which temperatures sometimes did not rise above 0° Fahrenheit for weeks at a time.